**BFA Update out! Download Here. Unique and Beautiful mod for Unit, Target and Focus frames with fat HP/Mana bars but still very close to the original Blizzard UI style. NOTE: Earlier versions of whoa UnitFrames used folders "CharacterFrame" and "TargetingFrame" located in "World of Warcraft/Interface" folder. From now on whoaUnitFrames does not require them. Re sizable buffs/debuffs displayed on UniFrames. Threat indicator moved from the targetframe to the playerframe. Player/Target/Focus frames re sizable. WARNING: veeery sensitive. OOC Transparency (disabled by default). 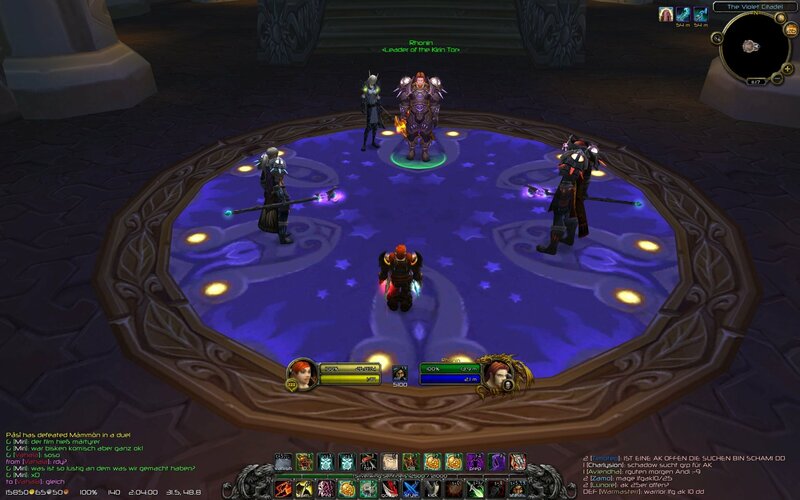 Uses Blizzard default statusText or whoa UnitFrames statusText stysle. whoa StatusText settings (config.lua). No GUI atm but class specific configuration possible. simpleHealth: optional simple health (rounded health and mana points). thousandSeparators: optional health and mana points with 1000 separators. showMaxHealth - Shows max hp (useful for PvP). autoManaPercent: show actual health/mana points in percent. Optional percentage @mana bars. petFrameOnTop - Shows pet frame over player frame. Useful if you moved player frame from it´s default position. hitIndicators - Shows hit indicators player frame. showToTName - Shows Target of Target frame. On next Update: customFontSize Set custom font size for Player/Target/Focus frames. No GUI atm, configuration in file config.lua (class specific configuration possible). 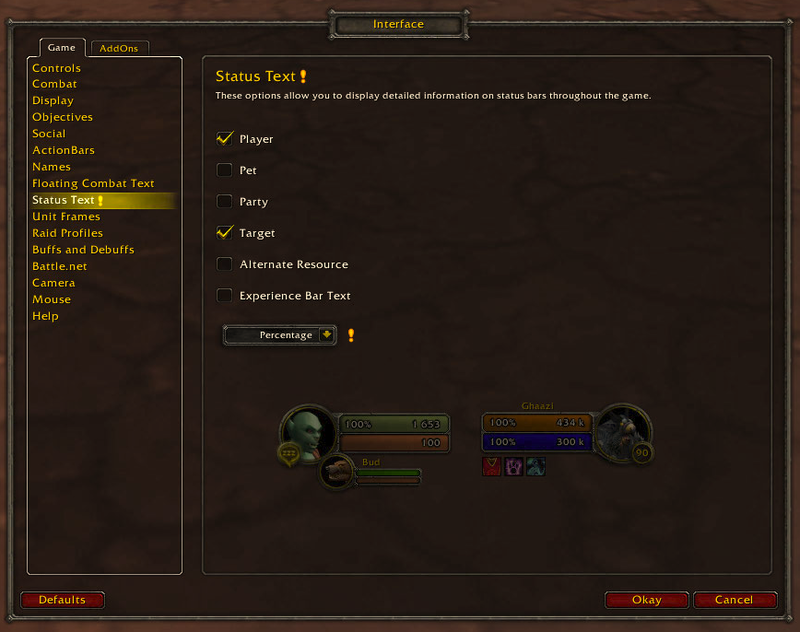 enable status text in Blizzard config: » Interface » Display » Status text : Numeric/Percent/Both. 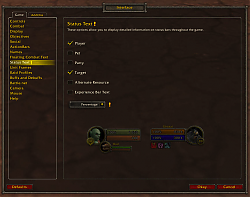 enable status text in Blizzard config: » Interface » Display » Status text : Numeric/percent. 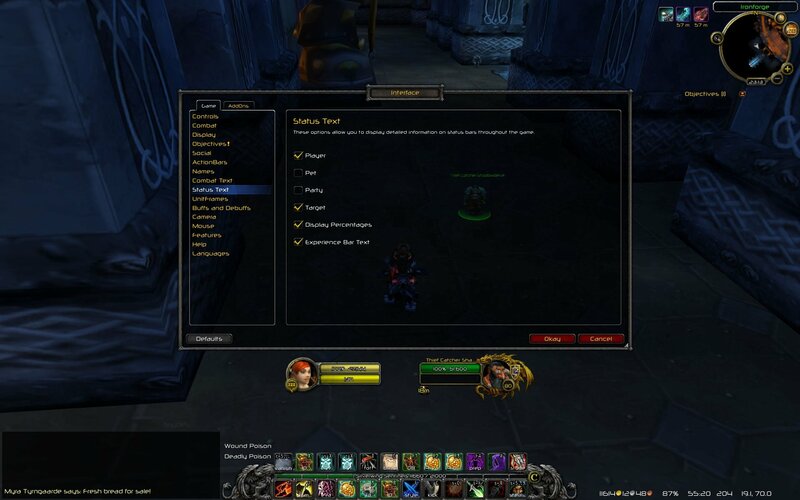 disable status text in Blizzard config: » Interface » Display » Status text : None. Added option to disable powerBar glow animations. Fixed TargetFrame and FocusFrame background. Fixed vehicle mana bar display. 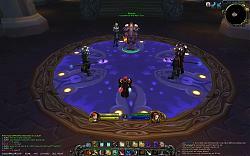 Restructured addon simplifying installation and update. This version is also initial Curse.com release. All files now packed within whoaUnitFrame´s addon folder. Unused files deleted. Updated PlayerFrame status text hp / mana / frame animations now fit perfectly. FocusFrame will now display tapped units as black. Fixed "customStatusText" when diplayed as "both" on blizzard menu. New project colaborator added, delabarra. how to increase the size of character names? Last edited by Langepac : 07-13-18 at 08:30 AM. Last edited by Trommy : 07-02-18 at 02:34 PM. BugGrabber and Swatter will continuously spam those errors while Blizzards LUA manager won´t. Having them disabled (or ignoring them) will cause no problems (at least until 7.0.3). Since i´m no longer active cant confirm same in later versions. Hi. Whats wrong? Whats error? 1x [ADDON_ACTION_BLOCKED] Аддон 'whoaUnitFrames' пытался вызвать защищенную функцию 'CompactRaidFrame1:ClearAllPoints()'. Re: Re: Disable cast bars? I am not very good with addon configuration. I was wondering if I can disable the cast bar for my target and TOT? I prefer quartz for that. Supposing you meant target / focus castbars this should do. Yeah, pretty much any castbars. My own, my targets, my focus', and my pets. Actually it was not working. i´ll check it. Last edited by delabarra : 12-19-16 at 08:54 AM. Last edited by Trommy : 12-09-16 at 10:49 AM. 1x [ADDON_ACTION_BLOCKED] Аддон 'whoaUnitFrames' пытался вызвать защищенную функцию 'CompactRaidFrame3:Show()'. Yup. ATM i´ve seen that error on some other addon to (frames and non-frames related). I belive somehow it´s triggered from some "hookfunction" due to API changes and it only pops when using "Raid Style Party Frames" (according to some testing). This is being checked but we´re also working on a few other changes to "whoa" so no update / fix yet. Last edited by Trommy : 12-07-16 at 11:44 AM. 2x [ADDON_ACTION_BLOCKED] AddOn 'whoaUnitFrames' ha cercato di chiamare la funzione protetta 'PartyMemberFrame2PetFrame:Hide()'. Are you sure you are not running 2 Unit Frames addons at same time? Hello. Someone know how move ToT-frame to top of target-frame at mirror position? For moving it take a look on whoaUnitFrames.lua the whoa:totFrame() funtion at line 315 and add values for whole frame and play with the values. Last edited by Trommy : 10-28-16 at 03:46 PM.